Cambridge Archives - Touch Display Research, Inc.
I’m traveling in Cambridge, England today. I had a chance to visit Light Blue Optics (LBO). Dr. Nic Lawrence, director of product management, and Ms. Evelyne Donnaes, Software team leader at LBO, showed me their touch and pen technologies. The last time I visit LBO in Cambridge is about 6 years ago when they were developing laser based pocket projectors. Since 2011, LBO has changed business direction and developed optical touch technology. LBO’s expertise is in the touch software, which they named Light Touch. 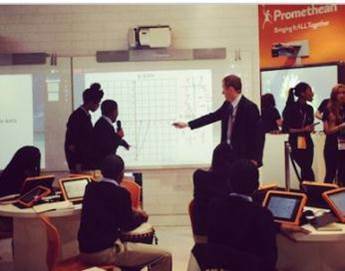 In January 2014, Light Blue Optics and Promethean announced the integration of LBO’s advanced Light Touch™ technology into ActivWall – Promethean’s newest digital classroom projection offering. The ActivWall is an interactive digital surface that may be positioned both “front and back” in the classroom. In order to design digital classroom surfaces that allow multiple groups of students to simultaneously collaborate, the new ActivWall features Light Blue Optics’ unique Light Touch™ technology that supports differentiated pen (i.e. the system identifies whether the contact is a pen or touch and operates accordingly) and up to 20 simultaneous touches. LBO also claims their system is lower cost than competitors. Detail analysis, comparisons of touch and pen technologies can be found in our monthly report: Touch and Emerging Display report, April 2014 issue. This entry was posted in Active Pen, Company News, Displays, Touch screens and tagged active pen, Cambridge, Large display, Light Blue Optics, Light touch, Promethean, touch display research, Touch screen, touchscreen on April 17, 2014 by jennycolegrove.